This one should come as no surprise given my recent post about our family's reading plan for Harry Potter. We don't own the entire series (yet), but luckily we had this one. I say luckily because, for a book that's approaching twenty years old, you'd be surprised how difficult it is to land (and then keep) a library copy. 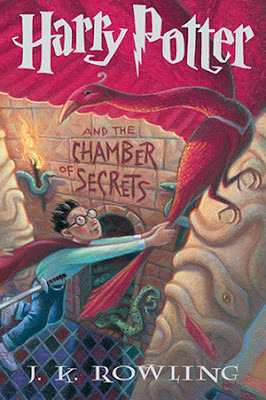 I was fourteen when this book came out in the U.S. My interest in Harry Potter hadn't fizzled yet, and I read it soon after it was released (as I recall, Harry Potter hadn't caught on in my little town at that point and so I don't think I even had to wait for anyone to read it before me). But now, seventeen years later, my memory served me very little during this second reading. I didn't remember that Harry and Ron arrive at Hogwarts by illegally flying a car. I didn't remember anything about a little house elf named Dobby and his warnings. I didn't remember that Hermione is in an incapacitated state for part of the book. I didn't even remember Tom Riddle's true identity. Most of the time, having such a poor memory is rather depressing, but when it comes to reading a book, it's actually rather fantastic. Here I was reading this book to my kids, and it was like I was experiencing the entire story for the first time. I bet some of you wish you could repeat your first experience with Harry Potter because really, there's just nothing like that first time. So instead of just my kids hiding their eyes and yelling out and bouncing up and down with anticipation because they didn't know what was going to happen, I was right there with them. It was so much fun. Aaron, Maxwell, and Bradley all listened to this one, and I will say that it got a little scary for them, especially Max. (At one point he admitted, "I am very concerned about this.") There were several times when he begged me to stop reading, but it was the kind of begging that happens when you're actually desperate to know what's going to happen but you don't know if you can handle it. It was the basilisk that really terrified him, and yet, when I got the audio for him after we'd finished the story, he listened to the last CD at least fifteen times and decided he wants to be a basilisk next year for Halloween, so I think it was the suspense of the unknown more than anything else that scared him (although we kept assuring him, "Max, this is just the second book, and there are five more after this, so we know Harry Potter doesn't die!"). It definitely doesn't have the kind of symbolism I love in The Chronicles of Narnia, but it still has some thought-provoking moments, like this wisdom from Professor Dumbledore at the end: "It is our choices, Harry, that show what we truly are, far more than our abilities." Now we're all eagerly anticipating Harry Potter and the Prisoner of Azkaban, but in the meantime, we'll just relive and reread our favorite parts from the first two books. I have wanted to read something by Eva Ibbotson for a long time. 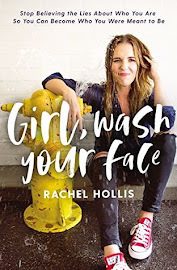 In fact, she was one of the authors who prompted me to make the goal, "Read a female author I've been meaning to read." I always thought I'd start with one of her historical romances, like The Countess Below Stairs, but one day I was at our local thrift store and happened upon several children's fantasy books by her. Up until that moment, I didn't even realize she'd written for children. I read the backs of the books and they all sounded delightful, so I purchased a couple, this being one of them. 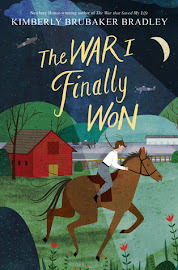 I thought it would be the perfect book to read to my kids in October, and it was, but it was not the perfect book for me. Rick does not enjoy life at boarding school, but things perk up considerably when a family of ghosts think his dormitory looks like an inviting new home. You see, the ghosts all across England have a real problem: all their old, dilapidated houses are being torn down or "modernized." There are just getting to be fewer and fewer dwellings that are fit for ghosts. Rick decides to take up the cause of the ghosts and go see the prime minister of England, in the hopes that he will agree to set aside some land for a ghost sanctuary. But not everyone sees the situation as Rick does. In fact, one person in particular would like to see England completely purged of ghosts. Okay, first of all, I have to tell you, my kids loved this book. The farther into it we got, the more I dreaded it and the more they wanted to read it. I would say things like, "I am so tired of this book" or "The sooner this book is over, the better," and they would respond with, "You can not stop reading it!!!" So we made it all the way through, but it was a slog, no question. I'm still trying to figure out why I didn't like it. The writing itself was fine; the story was full of action and drama; and it definitely felt seasonal. But . . . I didn't like the ghosts. In fact, I found them rather repulsive and in possession of the most disgusting habits. To name a few: The mother of the family (the Hag) gives off the most offensive odors around the clock; and the daughter, Winifred, follows around a bowl of water to wash out her never-disappearing bloodstains; and also, Aunt Hortensia, who lost her head to one of Henry the Eighth's rages, now carries it around with her. 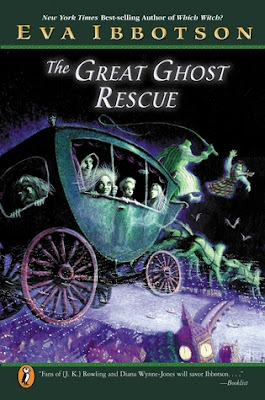 In small doses, all of these things might have been okay (I keep thinking back to Harry Potter and how I didn't mind Headless Nick or the other ghosts at all), but this book was saturated with ghosts. I mean, that's who the book is about! They're not sidekicks or secondary characters. Aside from Rick, they're it. If you can't champion the ghosts, you might as well not be reading the story. So yes, I sound prejudiced and, sadly, not too different from the villain himself, but honestly, I can only handle reading about the smell of pig's intestines and eating maggot sandwiches for so long before I want to dry heave, and that's just not what I'm looking for in reading material, you know? I'm not giving up on Eva Ibbotson, but this book was definitely not for me. Did you read any seasonal novels with your kids this month? And do you have any recommendations for us for next month? 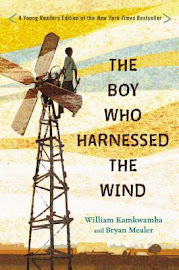 Last year we read Farmer Boy, and it was such a perfect November book that I keep wanting to duplicate that experience. I love Ibbotson, but I can see how her humor for kids is very broad. I bet you have problems with some Dahl as well. Her teen and adult books do not share this aspect.